Everything you need to give your 1 car door a complete tune up. 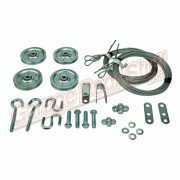 Over time, hinges, rollers, bearings, cables, top and bottom fixtures wear. 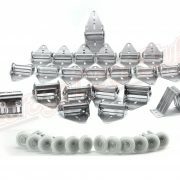 This kit will allow you to replace all that with better than new parts. 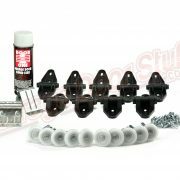 Hinges are 14 Gage, rollers are top of the line 13 ball bearing nylon. provide you with years of continual service. 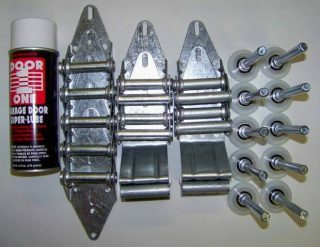 This STANDARD kit will really improve the doors performance, the rollers alone make an incredible difference. We do our best to bring our customers the best products at the best price. The included spray lube will lubricate the entire door 10+ times and last years. All moving parts of the garage door should be lubricated twice a year. A little preventive maintenance goes a long way on a garage door. Save yourself a costly service call and the inconvenience of having the door down. 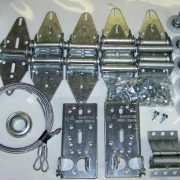 Be the first to review “Garage Door Hardware Kit” Click here to cancel reply.